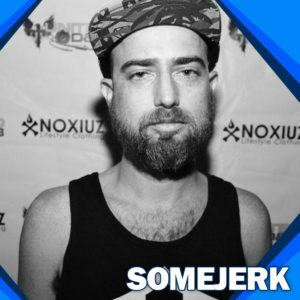 More in common with IDM than EDM, Miami’s somejerk has relentlessly fused the fringe of bass music and experimental funk, simultaneously riding and destroying the line that defines them. Born with a unique perception of time and space, enhanced with technology and dumb luck, somejerk is unpredictable in BPM but consistent in flavor and heaviness. First taking music “seriously” in 2007 when he was given the chance to open for Skream & Mala (Laundry Bar) and helping to push the first incarnation of the Miami Dubstep scene, John ‘somejerk’ Gregory’s influence in all things bass music can be traced back a bit further. Starting out as a graphic designer, graduating to promoter and finally a DJ, somejerk has played every role in the rave and now focuses on his first and truest love – creating the music that people lose their minds to. All the while, mostly kept to himself, he was developing his own production style and take on bass music, a decade before he would ever touch the decks. In 2010, the Miami New Times called him the “best new electronica producer” in the annual Best Of awards, an accolade that motivated the then beginning DJ to pursue it for real. That lead to a series of DJ gigs and residencies at venues such as The Vagabond, home to Get Low, Bar Black, home to DOWN and many other underground bass events. In 2012, SomeJerk established Signaflo, an underground bass music label curating releases from up and coming producers from around the world. Recently, he has returned to curating and promoting events, collaborating with some of South Florida’s most talented DJ’s and producers. BassLine Miami – held every first Sunday and sporadic Fridays at Kill Your Idol on South Beach – and Fat Beats – held at Original Fat Cats in Ft Lauderdale every second Monday.